As a mom of two avid readers, I was forced into learning about my public library. When Zach was an emerging reader, we loved to take trips to the mall near our house, stop in the bookstore, and buy cute little paperbacks that he loved to read. We would do that every 3 weeks or so, and most of the books he was reading back then were about $4-5 each. Not bad – a day’s entertainment at the mall and a few books from the bookstore for that price? Worth every penny… Because as we all know, the bookstore had the very loved (and germ-infested) train table – you know what I’m talking about… The very expensive Thomas the Train table for the children to play with as you browsed the book aisles nearby? We’ve all been there, right? And of course, as we all know, there is always just 1 train car for all the kids to play with. I know you all know what I’m talking about. And also at the train table, there is always that one child whose mom is not paying attention, and the unsupervised child is not letting any other kids have a turn with the one and only train car. On top of that, he’s stacking up all the train track pieces in his corner holding them hostage! At least that was usually my experience. 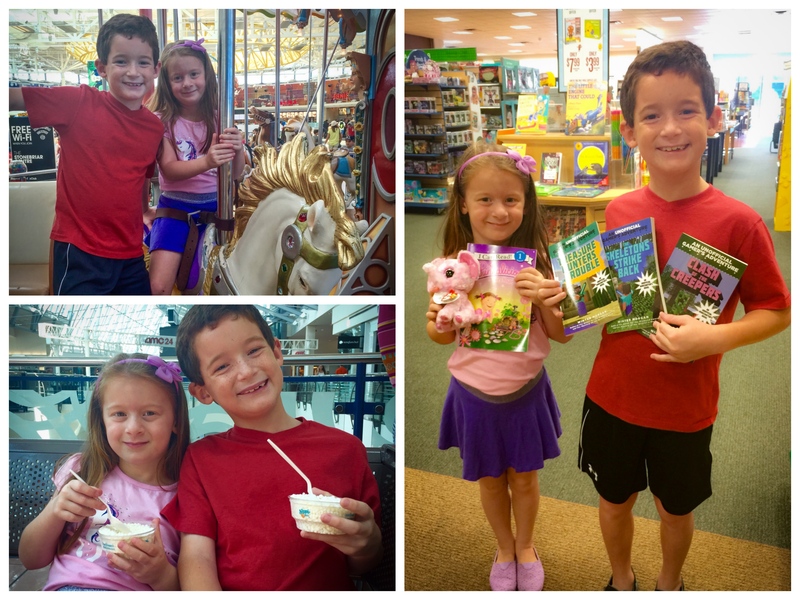 Well…I’m sad my kids are growing up so fast, but I’m glad that my train table at the bookstore days are over! Once we graduated from the train table at the bookstore stage, we encountered a new problem. That problem was – BOOKS ARE SO EXPENSIVE!! As Zach began to read longer and longer books, they became more expensive. Morgan, bless her little heart, has a knack for cute little paperback chapter books – the kind I can afford! With her bookstore money, she can come home with 3 or more books on each visit. Zach, on the other hand, is always intrigued by the giant hardback books – you know what I’m talking about, right? The books like The Way Things Work, and The Lego Ideas Book. Those awesome books with great pictures and fun information, but each one of them costs about $20! I just couldn’t afford these two book-lovers and their book buying habits that I myself had started! A very typical trip to the bookstore at our local mall! Books, toys, ice cream, and a carousel ride! Now do you see why I had to stop taking them?? Thank goodness one of my friends showed me the greatness that is our local, public library – the Allen Public Library! I had been in it a few times when my kids were little for story time, which I loved. But we usually hit meltdown shortly after story time, so we never stuck around to check out books. Now here we are years later, in a nice house with many bookshelves. We also have two kids and two adults who all read in the house! Our bookshelves are full! Don’t get me wrong, we do still hit the bookstore from time to time, but most of our reading is done using library books from our awesome Allen Public Library! I can’t say enough great things about all the doors it has opened for my kids (and me). We have checked out books, played chess, played checkers, researched things on the computers, gazed at the giant fish aquarium for long stretches of time, and so much more! And usually, when we have time in the summer, we check out our books and head over to the little cafe at the front of the library. If you haven’t stopped by for a snack (or lunch) if you live in Allen, you are missing out. 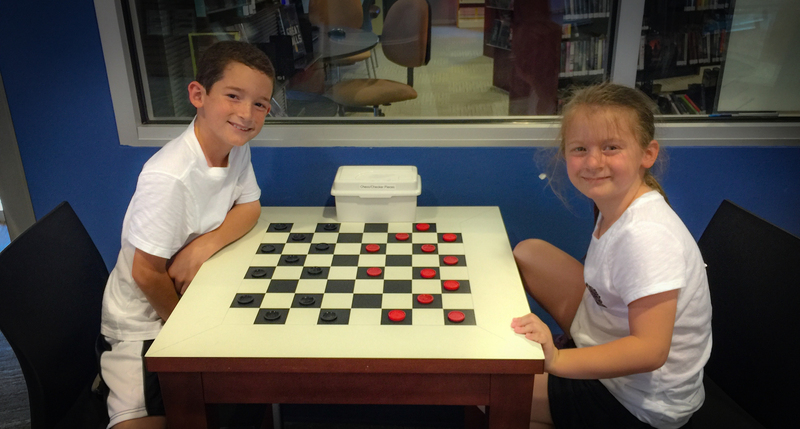 Here they are enjoying friendly (yet competitive) game of checkers before heading over to the cafe! I’m not sure every library has this little gem of a cafe, but if yours does, you should give it a try. We were pleasantly surprised at how yummy the food they served was. And with several little tables set up nearby, we would settle in with our milk, our cookie (or chips) and pull out a book to read while enjoying a little snack. If you are a proud card carrying member of the Allen Public Library, you might be interested to know that this 54,000-square-foot, two-story facility serves as the main hub for the community’s cultural, informational and learning needs. The library is dedicated to improving the quality of life of our users by supporting their life-long learning and informational needs. This is done by offering programs for specific user groups in our community, and by providing programs and services to meet the cultural and educational needs and interests in Allen. What is the History of the Allen Library? Mayor Gentry Jones proclaimed Allen Public Library Day on October 22, 1967, when the Allen Public Library (APL) first opened its doors as an all-volunteer organization. The library became a city department in 1971. In February 2005, the library opened in its current location at 300 North Allen Drive. 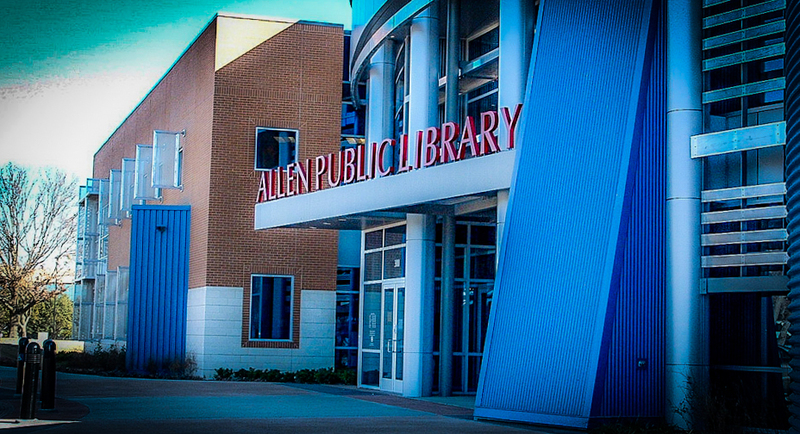 If you are an resident of Allen, you should read up on Friends of the Allen Public Library. 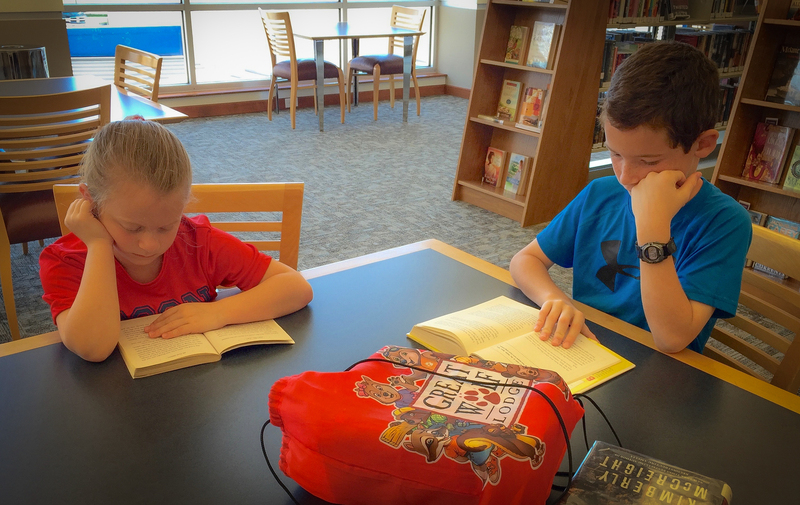 It is an all-volunteer, non-profit organization, dedicated to supporting the Allen Public Library by providing funds and programs that would not otherwise be possible. You can learn more about this organization on their website called Allen Friends. Here you will learn about all their wonderful programs they offer (and help with), their endowment fund, and many ways that you can volunteer to be a part of this organization. They also have a Friends of the Allen Public Library Facebook page. You can easily follow them here to keep up to date on all the events they are hosting, and hopefully find some ways to support them or become a part of one of their events or programs. But it’s very important that we remember that Friends of the Allen Public Library is an all-volunteer, non-profit organization, dedicated to supporting the Allen Public Library. They do this by providing funds and programs that would not otherwise be possible. Thankfully, they’re always very happy to sit and read their new books while I search the grown-up section for my own books! I usually get a good 10 minutes before they’re ready to hit the cafe! Very cool building, right? And on the other side, they have so many beautiful flowers in a wonderful courtyard area! PreviousMacro Photography…Butterflies, Bugs and Spiders – Oh My!